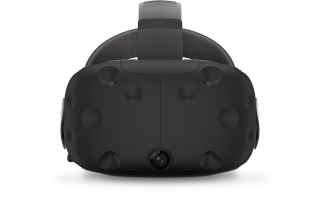 Virtual reality is set to kick off in a big way in 2016, and although the HTC Vive VR headset isn't going to be coming out until April, some leaked images have given us an early glimpse of what the consumer version is likely going to look like. According to some users on Reddit, images of both the headgear and the controllers have been leaked early on the HTC website. The headset looks pretty similar to what we've seen from the development kits of the HTC Vive, with a slightly smoother look to the front. It also has a nice casing to hide all of the wires from the top, and the camera is now in the center at the bottom. Meanwhile the controllers also look much smoother and more finished than the dev kit prototypes, and now have circular sensor mounts rather than the old hexagonal ones. The buttons and triggers have definitely benefited from some ergonomic refinement since the dev kit builds. These images haven't been confirmed yet by HTC, but with only a few weeks until CES, we won't have to wait long to find out. For the sake of comparison, the old headset and controllers are below.